This project post is a part of a paid marketing campaign with Snap. Although this post is sponsored, the project idea & all opinions expressed are my own. Embroidery is a hobby that I love doing, but just haven't made the time to do much of it lately. After looking through the Amy Tangerine Plus One collection and saw the adorable embroidery kit, I knew it was time to get stitching again. 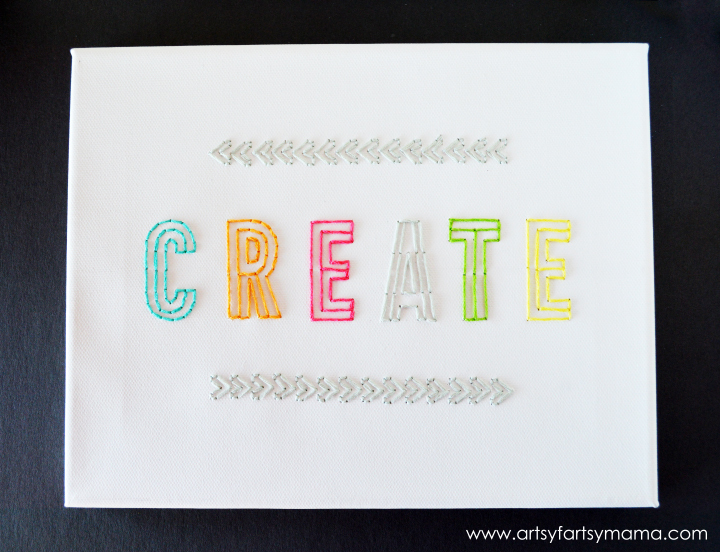 I can always use more wall art in my creative space, so I decided to embroider a canvas! The Amy Tangerine Plus One collection is SO cute! I love everything about it. The colors, the patterns, kits, and embellishments are so fun and I can't wait to create more projects with it all. 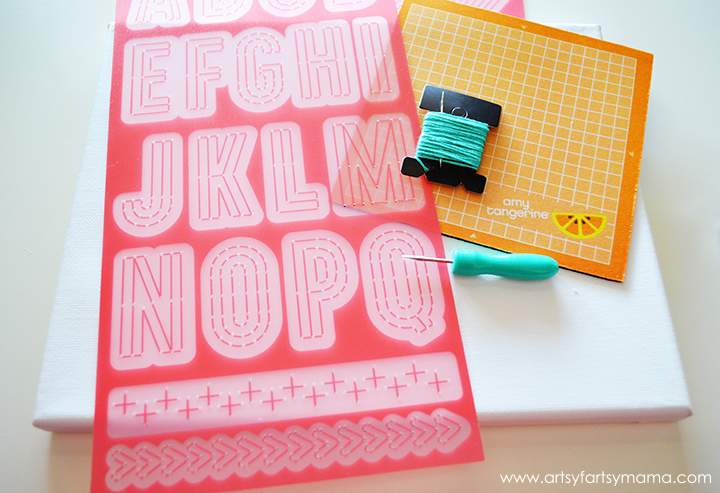 For the embroidered canvas, you'll need an 8x10 canvas, the Alphabet Embroidery Stencil Kit, and the Thread Kit. The kits include everything you'll need, including needles. I love the thread colors!! In the 5 Piece Embroidery Kit, you'll find alphabet and pattern stencils, needle for poking holes, a mat, thread, and needles. I've never used a kit like this before, and I really like the guide idea so you know exactly where your stitches need to be!! I marked the center of the canvas lightly with a pencil so I could try to align the letters as best as I could. Then, I laid the stencil on the canvas, held it in place and marked a few of the holes with the pencil for each letter so I could make sure the letters were where I wanted them to be. Next, I put the stencil back on the canvas and starting with the "C", I poked holes through the canvas using the dotted guides on the stencil. I poked the holes for all the letters before starting any of the stitching. Everyone does embroidery a little different, but the easiest way for me to do it is to tie a knot at the end of the thread, and pull the thread up through one of the holes. 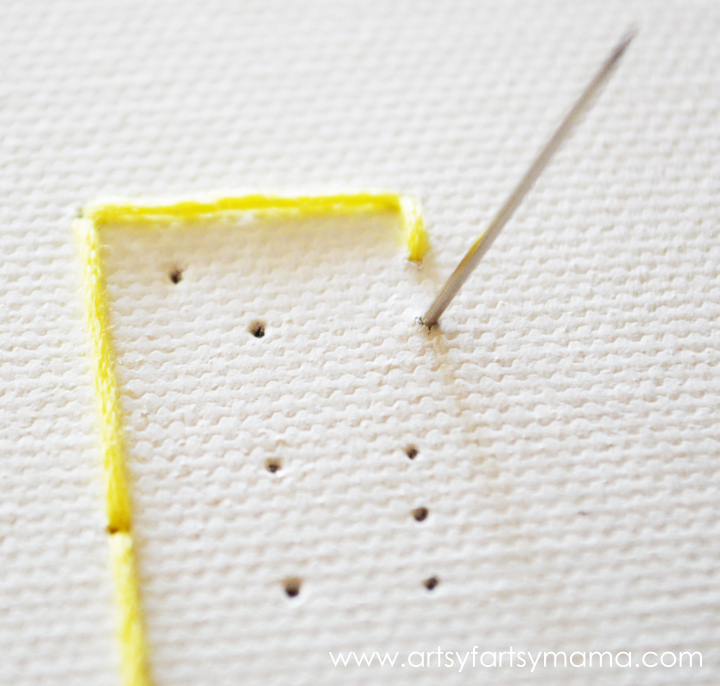 Then I backstitch the rest: come up a space ahead and bring your needle back down into the same hole at the end of the last stitch you made (there are lots of video tutorials out there if you need a little more visual help). Tie off the thread and cut when you finish each letter or are running out of thread. I stitched each letter in a different color thread (Aqua, Tangerine, Cherry, Grey, Cricket, and Lemon), then added an arrow pattern that was included on the stencil for a little something extra. I'm SO happy with how this canvas turned out, and can't wait to create more cute projects with the papers and embellishments!! The Amy Tangerine Plus One paper craft collection will be available for sale on HSN on March 24th. It was the top selling signature line released in Winter 2013 and sold out in both stores and online! The collection will be available in 5 discounted bundles including a basic kit, a stamping kit, an embellishment kit, and an embroidery kit - all starting at just under $20!! If you love Project Life, the sold out Plus One Project Life Mini Kit will also be available at a discounted rate. This would be GREAT for kids! Can't wait to find it! Adorable my dear! Love this! In love with it!!! Way to be so cute! Oh I just love this! I have this same kit and think it is so fun - love what you made with it! Yesssss I love this. I have the kit too, and am definitely using it on a canvas now. So smart. This is so cool, Lindsay! 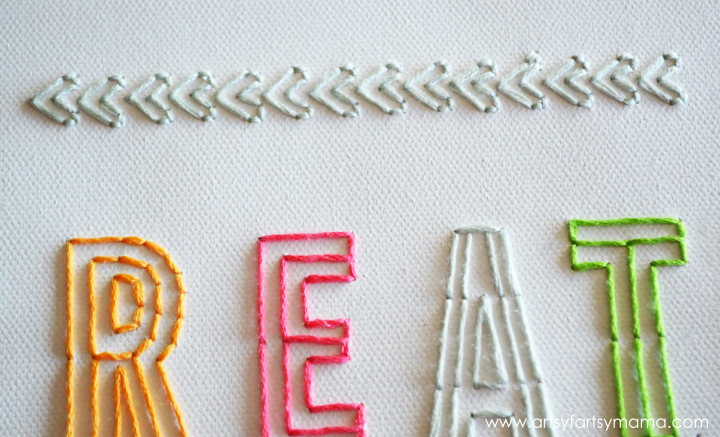 I love the idea of stitching on canvas. I want one of these embroidery stencil sets! Ooh, that's a fun effect! Love it! Oh my goodness- what a great system for making this simple! I would honestly love to make something like this- turned out awesome! ADORABLE! I love the way this turned out! The kit looks fantastic and easy to use. This absolutely sounds like something I need...simple & beautiful!! Will have to check this out for sure...thank you for sharing! Lindsay this is gorgeous! I never thought to embroider a canvas before but this is genius! Thanks for inspiring me! This turned out adorable. I considered stitching on canvas but was too chicken. You make it look easy peasy! Really love how this turned out! Love this Lindsay and you've inspired me to give the embroidery another shot to see if I can do a canvas with the kit. Wow, I love the colors and the simplicity of it! Beautiful! 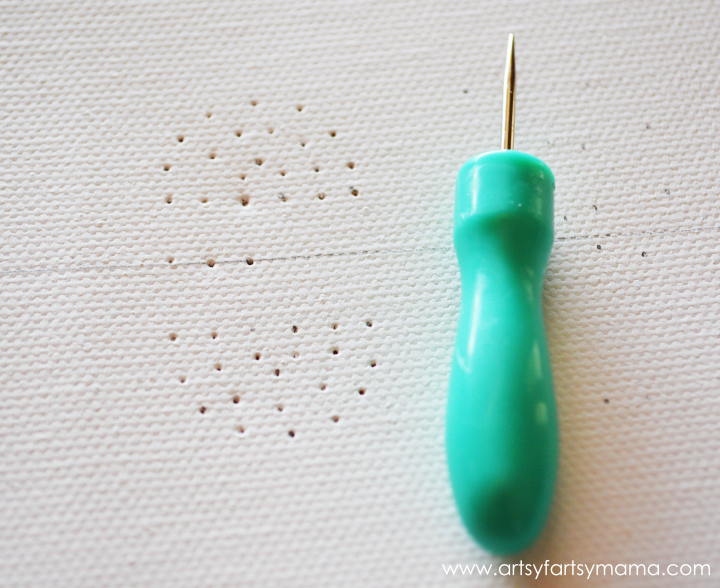 I wouldn't have thought to use the stencils and embroider on canvas, such a brilliant and fun idea! 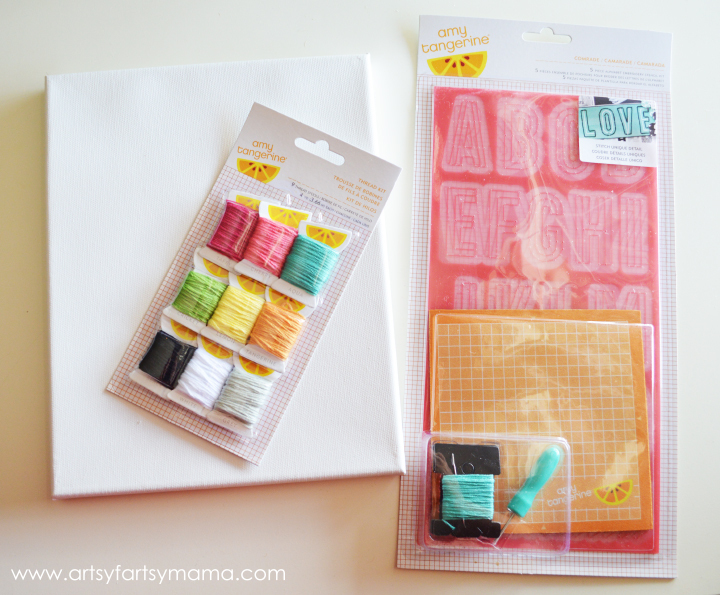 Great project--I love all the stuff from Amy Tangerine! Fantastic Post! GREAT Project! Congrats on your feature at "Wednesday Roundup" ! Well deserved! I know this is an older post but I just love this idea! I have a blank canvas sitting sadly in the corner of my craft room and I never can decide what to use it for. Now I have a plan.